Chinese five-spice consists of equal proportions of cinnamon, cloves, fennel seed, star anise and Szechuan peppercorns. You can find it packaged or in bulk at Asian markets and most supermarkets. Pat salmon steak with paper towels. Brush one side of steak with 1 tablespoon olive oil. 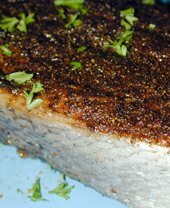 Pat a thick layer of five-spice powder (about 1 1/2 tablespoons) onto oiled surface of salmon. 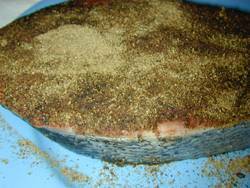 Pat on a generous layer of five-spice powder. Don’t worry if it looks like too much; it’s very mild. The oil will blend with it during cooking and form a nice crust.Repeat oil and season other side. Grill over medium-hot coals for 5 minutes. Flip and grill an additional 2-5 minutes, until done. You can use a thin knife slid in near the bone to peek inside steak to determine doneness. Drizzle with additional olive oil and serve with lemon wedges. We’re big fans of Agrumato fruit-pressed olive oil here at Out of the Frying Pan. It’s expensive (about $20 for a 7 ounce bottle), but a little goes a long way. If you compare it to buying a bottle of wine and consider how much longer it will last, it’s easy to view as a worthwhile investment. Agrumato crushes citrus with the olives rather than infusing the oil resulting in a smoother fruitalicious kick. Imported by Manicaretti, Agrumato is available in four varieties each in a handsome bottle: lemon, orange, tangerine and lemon & herbs. For this recipe, if you can’t find Agrumato, pick an olive oil infused with tangerines or oranges. Failing that, add 2 teaspoons fresh orange zest in plain olive oil before brushing it on the salmon steaks. This entry was posted on Thursday, September 6th, 2007 at 7:38 am	and is filed under Carnivore, Cookout, Main Dishes, Master Recipe Index, Speed Queen (30 min/less). You can follow any responses to this entry through the RSS 2.0 feed. You can leave a response, or trackback from your own site.